Something about the final panel of today's comic made me think of the confrontation between Atreyu and Gmork from The Neverending Story. One of my favorite scenes in one of my favorite movies. That face in the last panel is actually quite a bit intimidating. Also, I see bad things happening soon for Selkie since one of her little heat-things fell out. I actually sketched out an alternate expression where Selkie was making one of those small knowing smiles that just so happened to reveal her sharp teeth. I didn’t go with it though because it made the expression a touch too creepy, and smiling in this scenario implies a sort of barbarian battle-lust that I didn’t want to suggest. Hey! Don’t knock barbarian battle-lust when you have a little kid surrounded by schoolyard bullies. 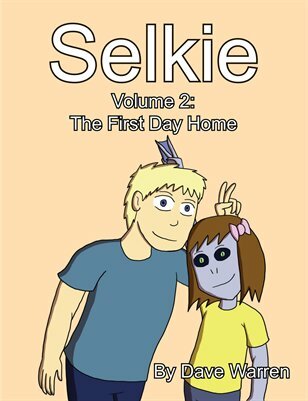 1) With a cold stare and smirk, Selkie taps at the window behind her – of the teachers’ lounge. 2) She lets off one of her soul-piercing shrieks, giving her a moment to escape while her assailants are recovering and alerting the teachers as well. 3) A played-straight Deus Ex Machina, where the teacher, already on the lookout for Selkie, who she now knows fibbed about her being OK in the cold, would just happen to turn the corner when Selkie’s about to be pelted with snowballs. I dunno the rules of Dues Ex Machinas, but is it still a DuesEx if the teacher’s skepticism at Selkie’s truthfulness was foreshadowed? I thought DeusEx’s only happened when the intervention happened with a complete lack of foreshadowing. Or is a DuesEx anytime a character gets saved by outside forces beyond their knowledge? And as a caveat, I am neither confirming nor denying that #3 is how this will play out. It just posed an interesting question to me. If Dave never implied that the teacher would be sceptical, then it would be a Deus Ex Machina. Only problem is, Miss. Afkhami (IIRC) looked REALLY sceptical. A snowball hitting the window of the teacher’s lounge as Selkie dodges it, and thus making a teacher open a window and thusly save Selkie from her position… THAT would be a Deus Ex Machina. But since Dave first had her in mind with a creepy smirk that revealed her teeth… I think he has planned for her to battle them out. Since Selkie as much as stated she was going to find a teacher, I don’t think that Selkie sneakily setting up her valiant last stand with her back to the window of the teachers’ lounge requires a large machina for the dei. I think the staff are likely to be witnesses to her being skunked and facewashed* in a moment, and while they might not intervene if they saw a different kid being assaulted with snow, their knowledge of how easily Selkie gets chilled is likely to make them stick heads out of the window and yell, even if this is their break time and they would so much rather huddle inside where they don’t have to be on duty. *For those who grew up in California, skunking is the process of making a white stripe in snow down someone’s back, (generally, but not always done on the outside of the snowsuit) and face washing involves a mitten full of snow and vigorous application to someone else’s face. Of the two face washing is the worse because if the snow is crunchy instead of fluffy you end up with scrapes from the little bits of ice. Thank you. Having grown up in Florida, while I could guess “face washing”, “skunking” would have eluded me. I’m still seeing, somehow, a scenario involving a screech and yellow ice in the underwear. I never knew the term for it, but I got facewashed once when I was a kid. I was about nine or so. There was a snowball fight on the school’s soccer field and I wanted to join in. I vaguely remember it being a school-sanctioned snowball fight as a recess activity but that may be the years talking and not actually true. I started joining in the fun and throwing snow and someway or another, I ended up knocked to the ground and my arms and legs held down while some bigger kids knocked my glasses off and scrubbed snow into my face. Also, from panel two we can see that the place Selkie has been cornered is within the sightline of the other kids in the playground. Where there are that many kids surely there must be a superviser who could see. You’re right. However, I’d still call it at least a contrived coincident that the teacher would just round the corner wintnessing something pretty much unrelated to the stuff she set out for (other than the fact that both concern Selkie). What about having the other kids in the playground coming to Selkie’s rescue? Oh, no! Selkie’s hair clip! No, the purple thing that’s still in her hair is the hair clip. The orange thing that went flying is a heat pack. Note that she’s up against the building windows and a teacher might see. And losing the heating pack is probably not good for her. I hope teachers interfere (or one of the 3 bullies breaks a window with their snowballs) before she gets hypothermia. Deeply relieved. Thanks for pointing that out. Deeply relieved about the hair clip – thanks for correcting me! I like those boots!! I see Sue and Kathryn! I have been reading since day one but have never commented. But I just had to sign in today to tell you that this comic beautifully illustrates how far you have come as an artist and to thank you for sharing this story with us! This happened on the last page and I forgot to comment on it, but I wonder why Amanda calls her fish face? Shark face would be more appropriate since she looks more like a shark or barracuda than a fish. Kind of what Vash said. Shark-Face sounds almost like a compliment. Was there a rock in that snowball? I wouldn’t trip while running if they throw a normal snowball at my legs. Probably a chunk of ice -much easier to claim innocence if somebody gets dinged where there isn’t snow suit padding and starts to bleed. How do I know this…? Er, it’s just one of those things Canadians are born knowing? Also possible is ice under the snow making the ground much slipperyer.